Tucked in the forests of southeast Alaska, surrounded by spectacular peaks, glaciers, rivers and lakes, and home to abundant birds and wildlife, Haines offers unlimited opportunities for outdoor and guided excursions to suit many interests. 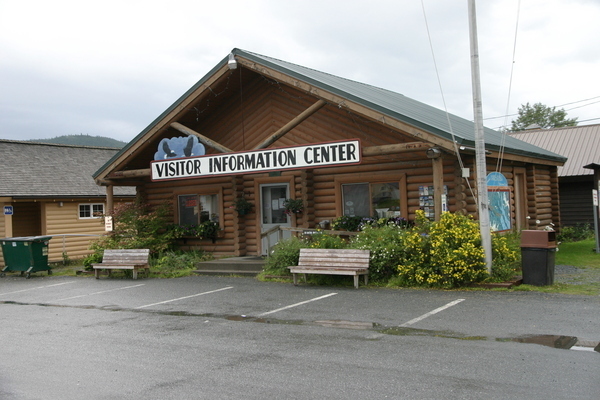 Providing a full range of business services for visitors, the town is everything you dreamed Alaska would be. Haines is located in a spectacular setting on the Chilkat Peninsula near the northern end of Lynn Canal. Circled by towering mountains, Haines offers magnificent views in every direction. The town is bordered by the spectacular Chilkat Mountain Range on the west and the Coast Range on the east. The historic routes to the Klondike gold fields - the Chilkat, Chilkoot and White Pass are to the north of the community. The best ways to access this friendly community are the three airlines flying into Haines, the Alaska Marine Highway System, and the Haines Highway, which closely follows the Dalton Trail to the Klondike Gold Fields. Haines and Skagway are the only two Southeastern Alaska towns served by the Alaska Marine Highway System that have connecting highways to the Yukon and interior Alaska. Haines was originally settled by the Tlingit Native tribes of the Chilkat and Chilkoot clans. They chose this area because of its mild climate and the abundance of fish and game. Near the end of the 18th century when the first white people came, the Chilkats were well established as a powerful trading tribe. They became quite rich by trading rendered fish oil for furs and skins produced in the interior. As a white settlement, Haines was established in 1880 as a Presbyterian mission. The mission included a school, church, and meeting hall and was named after Mrs. F. E. Haines, the secretary of the Presbyterian Home Mission. Commerce, farming, fishing and government followed the establishment of the mission and contributed to the area's growth. Haines served as an important supply base for the Porcupine mining district as well as the beginning of the Dalton Trail to the gold fields. In 1903 an Army fort was constructed. Fully garrisoned by 1905, its purpose was to keep peace and maintain law and order in this remote part of the new territory of Alaska in the wake of the gold rush. Haines was incorporated as a city in 1910. Outdoor recreation of all kinds is enjoyed year-round. Fishing for king, chum, pink and sockeye salmon as well as halibut is excellent in Lynn Canal. Shellfish such as crab and shrimp are also caught; however, catches are regulated by the State of Alaska. Wildlife includes black and brown bear, moose and mountain goats. The region around Haines is the only place in Southeastern Alaska that supports mountain goats and moose, and it is thought that these two species migrated into the area following the opening of the Haines Highway. 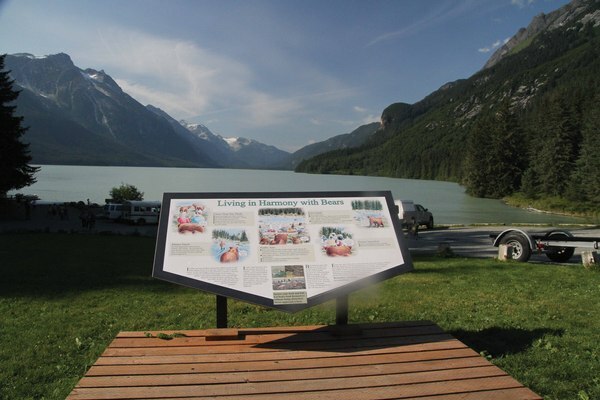 Located a 15 minute drive from Haines, Chilkoot Lake State Recreation Site is very popular for salmon fishing and bear viewing. With four salmon runs from mid-June to mid-October, the area is considered something of a "bear highway." Mother and cub brown bears start showing up in July, and can often be seen right on the road. The area can get a little crazy with fishermen, buses and bears converging along the mile-long Chilkoot River, which connects the lake with saltwater fjords. Sight-seeing tour companies offer a variety of tours for travelers who are interested in natural history and bird watching. 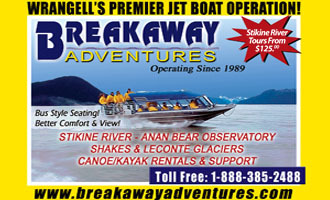 A local tour boat operator offers trips on Chilkoot Lake, and three air services are available for flightseeing trips to Glacier Bay, which is only a short distance by air from Haines. The Native people of the Haines area are very rich in cultural assets. They are impressive artisans and craftsmen whose artwork often takes the form of wood carving and totem pole carving, metalwork, and most famous of all, Chilkat blanket weaving. The Alaska Indian Arts Center features native arts and crafts. Several notable totem poles are displayed in Haines: Friendship Pole in front of the Elementary School; Thunderbird Pole at Chilkat Center for the Arts; Twin Headed Poles at Waterfront Park on Beach Road; Welcome Totems at the town's entrance on Haines Highway and in Totem Village. Located in the center of downtown just off Main Street, the Haines Sheldon Museum has attractive displays of Native artifacts and early memorabilia of Haines’ past. Additional attractions of special interest in Haines include Fort William H. Seward, Chilkat State Park and Klukwan Native Village. In 1943 the U.S. military built the Haines Highway, following the historic Dalton Trail. Today, the fully-paved highway is the most direct route from the Inside Passage to the interior of Alaska. Many say it is the most scenic drive they have taken anywhere in the world. The highway passes through the Eagle Preserve, then climbs to the impressive summit of Chilkat pass, 62 miles from Haines. Here the road parallels Canada's Tatshenshini-Alsek Provincial Park and Kluane National Park, the latter having been designated a "World Heritage Site" by the United Nations. In the vicinity of the village of Klukshu, native fish traps are still used on rivers and creeks. Good overnight or picnic sites along the Haines Highway include Alaska's Mosquito Lake State Park and Canada's Million Dollar Falls, Mush Lake, Dezadeash Lake and Kathleen Lake. Fish for trout, grayling and char in the rivers and lakes along the route. Also watch for well-marked hiking trails along the highway on both sides of the border. Local accommodations include several campground and RV parks, hotels, motels and bed and breakfasts. If you’re ready for a bit of magic, to be charmed and transported to the realm of imagination and synthesis, a visit to the Sea Wolf Gallery is in order. Owner Tresham Gregg will be your host on what may very well prove to be your most refreshing and intriguing Alaskan venture into the arts. 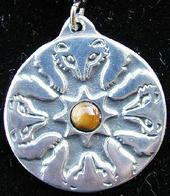 His multi-media works are transformational, mystical and filled with the unseen spirit of the land. A well-established Haines artist, Tresham explores spirit totems in masks, wood carvings,totem poles, puppetry, talismanic tribal jewelry and graphic art. The woods he utilizes come from the local forests, where he is often intuitively guided to his sources. Tresham started carving as a young teenager growing up in Fort Seward as a member of a Boy Scout troop learning Native art and culture,creating regalia and performing masked dance theater shows of Native legends - making the connection between the wild animals of the land, sea and sky, and that spirit place where animals take on human characteristics with a supernatural perspective. He was also inspired by his father, one of the founders of the present incarnation of Fort Seward, a skilled carpenter who turned wooden bowls, produced Native art and worked with cast plaster. These invaluable early experiences are intrinsically bound to who he is today as an artist. The Sea Wolf Gallery is located in a replica trapper’s cabin at the Fort Seward Parade Grounds in downtown Haines, where Tresham is often at work in the studio gallery. Lucky visitors may discover themselves treated to one of his captivating impromptu puppet shows exploring the domain of the supernatural. Dance, fantasy forms and flowing movement are dynamic elements in his work, illuminating the connection to a subconscious guiding hand. Revealing and animating natural phenomenon as spirit forces, his enchanting, powerful and wildly gorgeous pieces speak directly to the soul. Tresham also describes himself as an artistic adventurer, traveling to other locales and exploring the art forms of different cultures, engaging with local Mayan young people in Guatemala for instance, in the masked dance theater performance Return of the Jaguar. So when you are out exploring all Haines has to offer, be sure to pop into the welcoming environment of the Sea Wolf Gallery and let Tresham be your guide through a world that will tantalize your eyes and charm your inner child. Located about 15 miles northeast of Haines, the Alaska Chilkat Bald Eagle Preserve is the site for the largest gathering of bald eagles in the world. Eagles are plentiful throughout southeast Alaska and may be observed any time during the year. However, the largest concentration starts in November and lasts through January, when as many as 3,500 eagles gather along a four mile stretch of the Chilkat River for a late salmon run. Warm water upwellings in the river keep this stretch ice-free, providing access to fish when food supplies are exhausted elsewhere. Eagles flock from as far away as Washington State for the abundant feast. Starting in late October, eagles by the hundreds can be seen along the sand bars and in cottonwood trees on the 49,000-acre Preserve. which was created in 1982 to protect critical habitat. One of the best ways to experience the Preserve is to explore by jet boat or float through it on a raft trip. Trips depart daily from Haines. The Chilkat River is an unusual and unique river system, whose slow moving muddy brown water gets its color from silt caused by melting glaciers. These glaciers slowly move over the landscape and gather rock from surrounding terrain, which is ground into fine silt known as "rock flour." The silt creates sandbars, making the Chilkat the shallowest navigable river in Alaska. Jet boats are designed specifically for this type of river system, maneuvering easily among the shallow, narrow channels, taking visitors deep into the heart of the preserve that is otherwise inaccessible. Bald Eagle nests are plentiful along the river and usually have nesting pairs in them. Trumpeter swans are abundant from mid-May until mid-June and again from late July to mid-September. Visitors may also encounter moose with their young alongside the river's edge or even catch them swimming the river channels as they cross over to other feeding grounds. 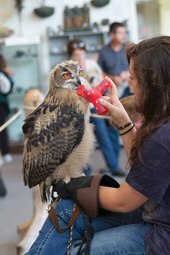 Located just two blocks from the center of town, the American Bald Eagle Foundation is a natural history museum and live raptor center, which conducts fascinating and educational live bird presentations, aviary and natural history tours. 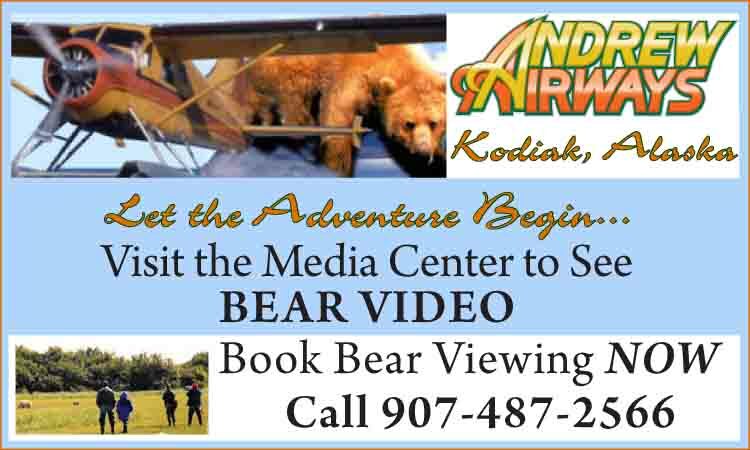 Call 907-766-3094 for scheduling information. Their unique wildlife diorama features over 200 specimens illustrating the delicate balance of the 48,000 acre Chilkat Preserve. Visitors may have the opportunity to sponsor one of their dozen resident raptors, including eagles, owls, hawks and falcons, or adopt and sponsor an eagle’s nest. Admission is free for childen under 8 and military, $5 under 17, seniors $8 and adults $10. The carved bald eagle sign at the front of the building was fashioned by local artist Tresham Gregg, as was the impressive main ‘Welcome to Haines’ sign. The Alaska Bald Eagle Festival is held in mid-November and has a schedule of events catering to birdwatchers, photographers and nature lovers. Event highlights include photo workshops, guided eagle viewing, release of wild rehabilitated bald eagles, special speakers and presentations, banquet and auction. For information, contact the American Bald Eagle Foundation at (907) 766-3094 or see www.baldeagles.org. Winter in Haines is an exceptional adventure, due in part to the mild climate and the variety and abundance of fit-to-suit tour and adventuring companies. For many visitors winter is the preferred time to be in Haines. The average temperature in November and March is around freezing, while in December through February the range is from 24 to 29 degrees Fahrenheit. 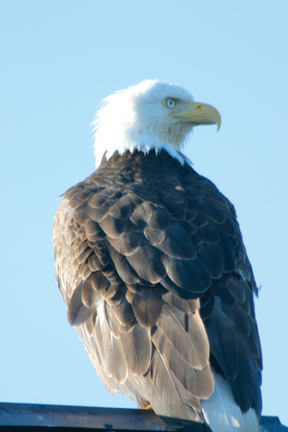 The season starts with the annual visit of up to 3,500 Bald Eagles from October through December. January brings longer days when the wintertime wilderness becomes a vast playground for activities such as dog mushing, snow shoeing and ice climbing. Whether it's cross country or backcountry, March and April's late spring skiing can't be beat. The Northern Lights put on a fine show in the crisper months and you'll always find a warm place to snuggle up or a hot spot to dine and dance after a day of playing in the snow. Helicopter sightseeing and heli-skiing or snowboarding have become increasingly popular in recent years. Custom snowmobiling and back country snow machine tours are readily available, with overnight lodging provided. All season specialty tours cater to interests in natural history, Alaskan history with the unique perspective that can only be provided by local historians familiar with ancient village sites and Tlingit place names, or wildlife and bird viewing and photography, coached by professionals. The winter landscape inspires and facilitates award winning photography.